Consumers have grown accustomed to having a variety of drink options at their disposal, which means restaurants can never have enough refrigeration devices to house them all. As a result, many restaurants are boosting their equipment to make room for more products. Business owners who want an affordable refrigeration option without wasting much space should consider the Turbo Air TBB-4SG Back Bar Cooler, three-section, 37-inch high unit. 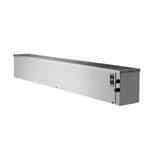 The commercial refrigerator is a top-of-the-line device that can be installed under an existing counter. The compact size allows restaurant owners to use the piece of equipment without having to give up much floor space. Restaurants that use cooling machines, such as the Turbo Air TBB-4SG Back Bar Cooler, find it much easier to stock a variety of beverages and supplies. If guests continuously come in for a specific type of beer, owners can make note of that demand and stock a section of their cooling units with those items. Such service goes a long way in creating customer loyalty, which can drive sales and help an organization expand far beyond its walls.